It’s happened only a few times so far – a fully finished object appears, seemingly out of the blue. No swatches, no turmoils, no ripping… voilà! Here it is! I concocted it out of thin air! While I was sleeping! All of the headache and heartache is behind the scenes, and simply doesn’t make it to the blog for one reason or another – gift, publication, shortage of time. Defeats the purpose of a knitting journal, don’t you think? This is where we record all our thoughts and observations, chronicle the birth and development of every project. Alas, reality isn’t always ideal, and sometimes we’re forced to read the final chapter before devouring the full story. Pattern: design based on a Komi mitten pattern in Charlene Schurch’s Mostly Mittens , p.66. Figuring out all the other details was my own doing. Yarn: Louet Gems sportweight, 100% superwash merino; one 50g skein of each 16/indigo, 57/French blue, and 50/sage; two 50g skeins of 43/pewter; pewter was the dominant color throughout. Needles: US 2 Susan Bates 16″ circular and Boye dpns . Gauge: stranded colorwork: 7.5 stitches and 8 rounds per inch; single-color stockinette: 5 stitches and 10 rounds per inch. Finished dimensions: approximately 22″ in circumference and 8.5″ deep. I’m not sure why I never got around to posting about this project. It certainly took me a while to knit it, plenty of time to snap a photo and make a formal introduction. I guess other discussions took precedence – while working on this hat, I also completed grandma’s beret, my Brilliant Retro (nope, not done seaming yet), and one other project which I’m saving for a future date. Now let’s take a step back. Mostly Mittens is a treasury of Komi patterns, from the Komi region of Northern Russia. 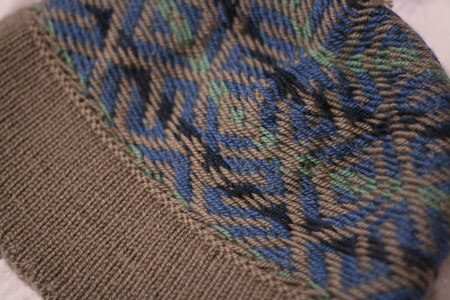 The stitch patterns are very angular in nature, and allow stunning color combinations and transitions. In this book, the patterns are showcased in the form of mittens, though Komi hats, sweaters, socks, and other knitted objects are also breathtaking. Several patterns from this book have always spoken to me, especially those with a uniform main color overlaid on a subtly-changing background (or vice versa). So, when an opportunity to knit a Komi hat presented itself, I immediately agreed, reasoning I could transform one of those lovely mitten patterns into a hat pattern. Once I completed the stranded part of the hat, I knit a turning round, and decreased about 30% of the stitches for the lining. Seems like a lot, doesn’t it? Well, the hat is pleasantly loose on the head, not my typical beanie at all, and the lining needed to be significantly smaller to keep the hat snugly on the head. Plus, we all know that gauge differs between knitting with one color, and stranded knitting (specifically, stranded knitting is more dense). So, I needed to decrease even more than expected to make up for the difference in gauge. After knitting the lining for a good 3″, I cast-off loosely (in purl: rolls less), and liberally whip-stitched the lining into place. Liberally because the circumference of the lining is smaller than that of the hat, and I didn’t want the point of attachment to draw in the stranded fabric any more than it had to. 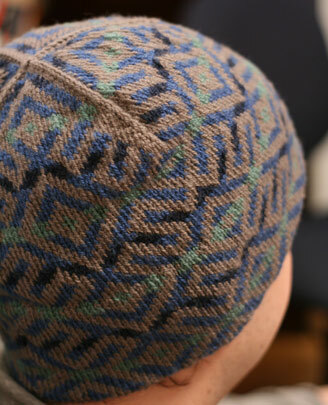 The end result – hat stays on, keeps the ears entirely warm, and the lining is inconspicuous from the outside. Thank you for the fabulous idea! A friend of mine asked me to make him a hat, and I wasn’t sure what to do. 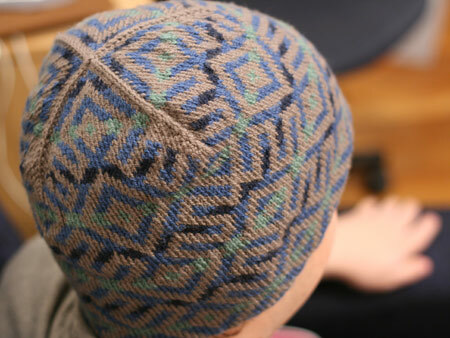 Turning a mitten pattern into a hat is brilliant! Very nice! Masculine, but still a fun & interesting knit, which can be hard to do. BTW. Do you sleep? Or have you given it up for knitting? It’s really, really beautiful. I really like the more stylized pattern with the color changes. It looks great! I was starting to wonder what ever happened to this project! I love the colors! The inside is magnificent — I’m about to try my first fair isle, so yours in an inspiration. Thank you for sharing. I look forward to your posts so much. That’s freakin’ gorgeous. Way to go! It’s beautiful! 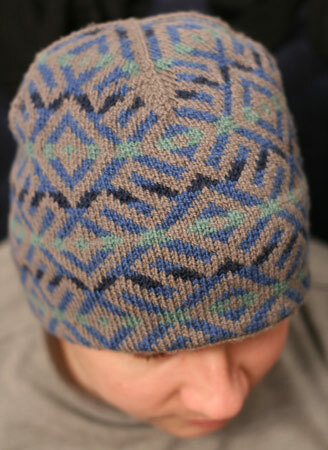 I recently made up a hat pattern with a similar kind of X at the top. It’s my new favorite hat detail! I’m disconcerted, by the way, to see that another Ashley commented before me. I was like, “did I already comment on this?” As though I am the only Ashley in the world. It’s beautiful! You’re making me really want to try Louet Gems as a yarn. Do you get it from them direct or do you have a favorite retailer? Kathy, I can’t put my finger on exactly why this piece speaks to me so much, but it really does. I love it. I’m going to have to adapt the pattern to something myself. The original mittens would not have grabbed my attention, but the hat is stunning. Great job. Fabulous! Wow. I love the way the pewter angles and wraps around the other colors. I find it interesting that you picked the pewter to be the dominant color — when I look at that pattern (even in the book), I consider what you call the “background” colors to be the foreground ones. Interesting how we all view everything differently. I love your color choices. The hat is very beautiful. Wow, this looks great! I like that you figured out how to apply mitten patterns to something else, and that it worked out so nicely in terms of the geometry and measurements. That yarn is one of my favorites. Great hat. Is everybody in a hat knitting mood right now? I just finished 4 in the last two weeks or so. Yours is absolutely fabulous, especially since you altered the pattern so perfectly. So nice! Are you going to publish the pattern? Your work is amazing! Wonderful job. Very handsome. Another great finished project. Congrats! I rarely leave comments but I can’t help myself today. I am amazed at how thoughtful your designs are. You pay great attention to detail and love how you chronicle everything in this blog. You are like the Alton Brown (Good Eats on Food Network) of knitters! I rarely leave comments but I can’t help myself today. I am amazed at how thoughtful your designs are. You pay great attention to detail and I love how you chronicle everything in this blog. You are like the Alton Brown (Good Eats on Food Network) of knitters! I like the fine detail and the geometry. It is a very sharp looking hat. The hat is stunning! I love the colors you chose. And the details, like the lines on the crown. Will you be posting a pattern in the future? The hat is very nice! Love the colors and the inside is neat as a pin! Fabulous! What a great hat – love the colors you chose. Beautiful hat! I have that book too. But too timid to try anything. I love the color combo you chose there; it’s understated, but beautiful, and that teal really pops – way to go on another success! P.S. I agree with Christy about the Alton Brown thing – you’re scientific and very knowledgeable without that irritating ‘I’m smarter than you’ mien that some scientists can get. Maybe it’s the earnestness and joy with which you share your knowledge. In any case, you rock, Lady! I love this! Will there be a pattern? I don’t know that I could rework a mitten pattern into a hat! What a fabulous hat and beautifully knitted too! This is absolutely stunning – one of the most beautiful hats I’ve seen for long! Fantastic work! Very beautiful! I love the way the inside looks, but I like the outside even more. My God! You’re amazing! I read that you’ve only been knitting for 2 years?? In this life maybe…in your last life you must have been Elizabeth Zimmermann!! And so useful with the way the temp has been around here lately! The back of your stranded knitting puts my attempts to shame. Hmm. I suppose the only answer is practice. Love how you did the lining. I’m working on a sweater with stranded knitting right now, and my gauge is tighter in the stockinette than in the color work – weird, huh? What a lovely hat! I have been totally addicted to hats this winter (although mine are nothing as lovely as your yet, and I am very interested in the idea of knitting a hat from the top down. This seems like a great way to get the length right with out having to rip back the decreasing at the top. Is there a basic top down hat recipe you follow?? I really want to try top down on my next hat. Great hat, Kathy. Really nice choice of colors. That is really beautiful. Love the lining design. I haven’t commented here before, but this hat just blew me away. Not only is the color pattern compelling, but I love the way you solved the crown decrease–the pattern really jumps out there in to an entirely different effect, but it still blends into the main section. Clever! The hat is a beautiful piece of design, both color and engineering. I have been impressed with all your designs, but I must say that this just blows me away. Really stunning work, and now I must go buy Mostly Mittens. It’s a wonderful feeling when a project just goes right the first time. Someone else said it too – I find the shifting colors pop more, to my eye, and I would have called the solid the background color. I love that we all see different things, but still a wonderful hat nonetheless. Your color choices are great–and the lining is fantastic–great job! I know you didn’t knit that in your sleep, because I saw you working on it! I’ve been anxiously waiting for the picture – it turned out so beautiful! I’m really craving doing some stranded knitting now, and I owe it all to you. Wow. Great inspiration as I get ready to knit my next hat. most impressive. girl you rock. i’m dumbfounded here… woah. So clever. 🙂 Leave it to you to figure out that four mitten backs equalled a hat circumference! Great hat and wonderful pictures! VERY nice hat! Beautifully executed and the inside looks almost as good as the outside. Your hat is gorgeous! The colors are beautiful and the execution is fabulous. Beautiful. I received my Interweave Knits today and looked up your socks right away. The hat is lovely, and the design is nearly mesmerizing with the intricate changes in shapes and colors. Brava, indeed! I want to thank you for the mini-seminars on blocking, seaming and sewing in zippers for a ribbed cardi. I have just finished the main pieces of ChicKnits’ Ribby Cardi, and I have your expertise and advice on how to proceed with these finishing steps. When I basted it together last night and used my little hair clips to hold the front together, I immediately flashed back to your photos of the same process. I, too, have always hated trying to find zip-front cardis or jackets of any sort that have a zipper short enough not to pooch. You know, the hat pattern reads different from the mitten pattern. (At least it does to me.) On the mitten, I see the light gray pattern as the design on the reddish background and on the hat I see the blue and green pattern as the design on a brownish background. At first I thought it was because the gray on the mitten was lighter than the other colors and the brown on the hat was darker, but that’s not true! I wonder what makes the difference? MAGNIFICENT! And you said you’ve only been knitting 2 years??? I am in awe. Love it!!! I hope the recipient is very, very happy.